This Dublin 6W derby was earmarked as the most interesting tie in the draw and it did not disappoint, in terms of competitive spirit. Referee Andrew Cole's patience was wearing thin with St Mary's from an early stage of the contest as their discipline appeared questionable. Sure enough, that patience finally ran out when he binned flanker Johnluc Carvill. Henry Roberts struck the first points in the 16th minute. 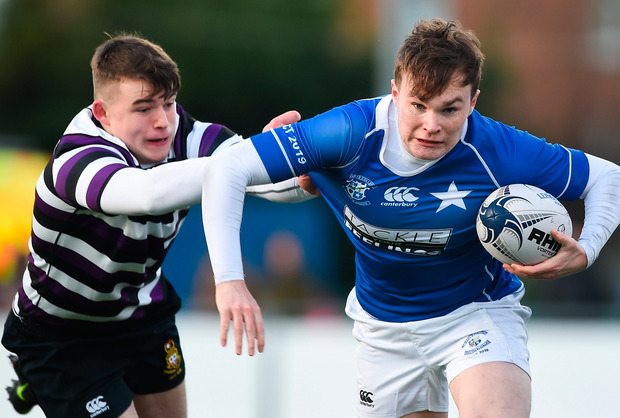 The game was crying out for a measured move and it came from Terenure, as centre Roberts shot a gap in midfield. Full-back Patsakorn Kidd came from deep to outpace the cover for a sweet move, Roberts converting for 10-0 at the break. St Mary's came out firing in the second half, with wing Eoin Carey moving to full-back to get more involved. 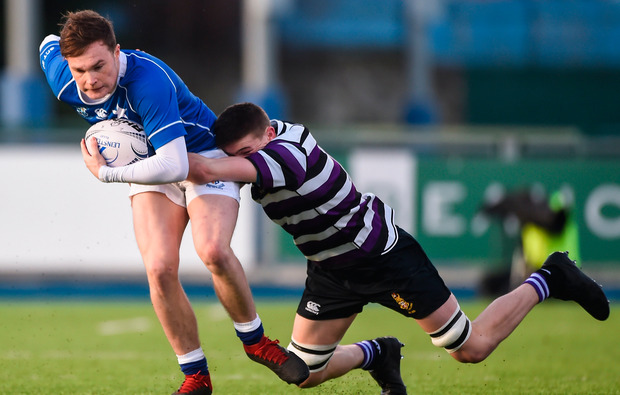 Lock Fionn O'Sullivan did not convince referee Cole he had grounded the ball from close range, waiting his turn to drive over one minute later to cut the deficit. It came down to which school scored next, and when Roberts struck a three-pointer, that was that. Terenure - P Kidd; D Byrne (A Cobianu, 66), M McGettrick, H Roberts, C McElwaine; G Morgan (capt) (A Dmeosey, 69), L McNamara; L Vaughan, A Dunne (A Byrne, 53), S McCoy (S Daly, 66), T Cadell (J Townsend, 46), A Deegan, C Hayes, T Ruane (C Harpuur, 43), P Larkin (J Keegan, 63). St Mary's - J McSharry (R Nolan ht); A Martin, M McEvoy, M Whelan (Joshua Coolican, 63), E Carey; A McEvoy, E Franklin (S Devereaux, 45); E Massey (Daragh Nulty, 60), C Walsh, M Connell, I Wickham (P McDermott, 59), F O'Sullivan, J Nolan, J Carvill (D Leane, 53), N Hurley (capt). REF - A Cole (Leinster Branch).